I’m pretty excited about our Sundays in July! This is a postcard I made to promote our activities this summer. They were handed out this morning and to say the least they are pretty stoked. We don’t always do CRAZY games, so they are looking forward to these Sundays in July. I also made matching slides for our instagram account and have buffered reminders throughout the summer so they can be reminded about what’s next. I found an amazing program to help me with buffering posts (more about that in my next blog) …I’m about to go on vacation but have 20 instagram posts scheduled for the month! Wahoo! Get youth ministry ideas delivered via email! Perhaps this is your first time to stop by lifeofayouthpastor.com or you have been here before. How about from now on you don’t need to “remember” to come back and check out new content, let me take care of that for you. Subscribe in the top right corner of this page and each new post will be delivered directly to your inbox for FREE. What kind of stuff will you get when you subscribe? A free download of my student ministry handbook. For student pastors and youth workers that feel alone – DIY student ministry. Here’s a free and easy group game that students love! This is in response to a former article I wrote on DIY Student Ministry. This is the second of ten areas that I’m covering in this series. I’m have been guilty of this more than once. Some could blame procrastination or a lack of creativity, but games for students can be down right hard! Planning, preparing and executing games for a program takes time, thought and energy. 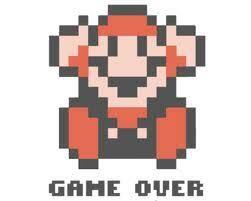 Though you can probably do both the teaching and games…DON’T DO IT! Sometimes this can come down to a trust issue, “They can’t do games the way I do games.” “They don’t understand all the logistics that go into a group game for 100 students.” “This volunteer is not capable of putting on the fun hat and really getting the students out of their comfort zone.” While all of this can be true, you need to teach them. Lead your leaders to be great at games. Share the burden of the program with other dedicated volunteers and get away from doing both games and teaching. You can be good at both, but better at one when you empower someone else to own the other. Doing this will only help you get away from a DIY student ministry. With that being said, I’d ask you to consider your student ministry philosophy of the program. What’s the purpose of a program? What’s the purpose of the game? Is it essential that I have a game in every program? These are some good questions to ask. What leaders come to mind when you think games? Who can be recruited, trained, and own this? Have a night without the game, do something different. Flip that around and have a night of programming that is just fun and games. Don’t give away a prize every time someone wins, this can get expensive! Let them just have the satisfaction of winning. Do a current inventory on all supplies, what can you use for games, what needs to be tossed? Have a healthy mix of both up front games and group games. Messy games are memorable games. Get more followers on Instragram – Do a Scavenger Hunt! I love scavenger hunts. It’s a thrill to race against time and compete for the prize. The team aspect is downright fun and helps people understand the importance of bringing others into the “picture” for a better outcome. 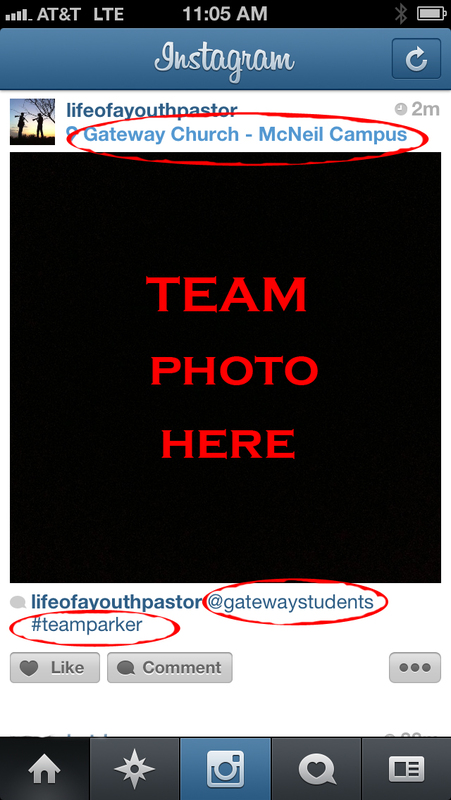 When doing this hunt last night our student ministry upped our followers on Instagram by 600!!! Ok…not quite that much, but we did get 25 new followers 🙂 Before you dismiss that, really consider what this means. Extending your reach through social media by doing something like this can capture the one person that “needs” to see your photos. Our students were the ones posting upwards of 10 photos a piece and tagging our group. Their friends from school, sports teams, work etc. saw these silly pictures, liked them and are now following the posts that I put up weekly informing students of gatherings, summer trip options, Biblical truth, and just funny, silly stuff. After the hunt we had some judges hop online and look at photos…we judged on timestamps, creativity, and those that best followed the directions. I printed off and gave them this picture to the right as an example before giving them the scavenger hunt challenge. Make sure students and those participating in the hunt understand the “MUST HAVES” so that you can leverage the game for the social media win! Use your team to build a pyramid. What time does our group meet on Wednesdays? Give us your best Chuck Norris pose!